City Hall where Dr Hobby had brought him to life enough that he was carried down to Hatties That his hands and feet were badly frozen. It was the worst shock I ever had. I was wild with grief. With Josie's help I emerged to get a little dinner and Will took me to town. I found him conscious and the folks composed. He said he was coming home about half past eleven and stepped from the road to the sidewalk to let a sleigh pass and he slipped striking his head on the railing and he tried to get up but could not. If he had been left there a half hour longer he would have been dead. 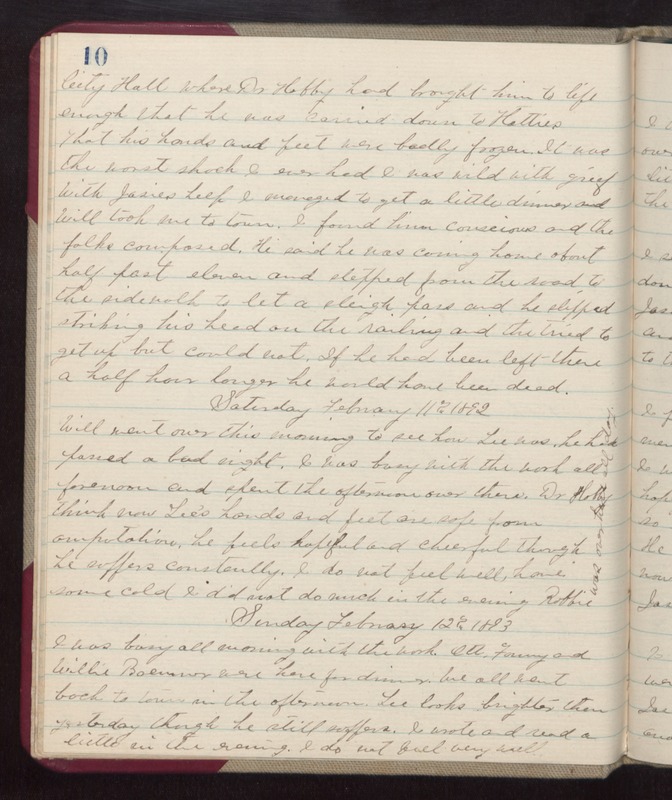 Saturday February 11th 1892 Will went over this morning to see how Lee was. He had passed a bad night. I was busy with the work all forenoon and spent the afternoon over there. Dr Hobby thinks now Lee's hands and feet are safe from amputation. He feels hopeful and cheerful though he suffers constantly. I do not feel well, have some cold. I did not do much in the evening. Robbie was over here all day. Sunday February 12th 1893 I was busy all morning with the work. Ott, Fanny, and Willie Bremner were here for dinner. We all went back to town in the afternoon. Lee looks brighter than yesterday though he still suffers. I wrote and read a little in the evening. I do not feel very well.